Keep calm and carry on is the message to those speculating again about his possible imminent resignation. 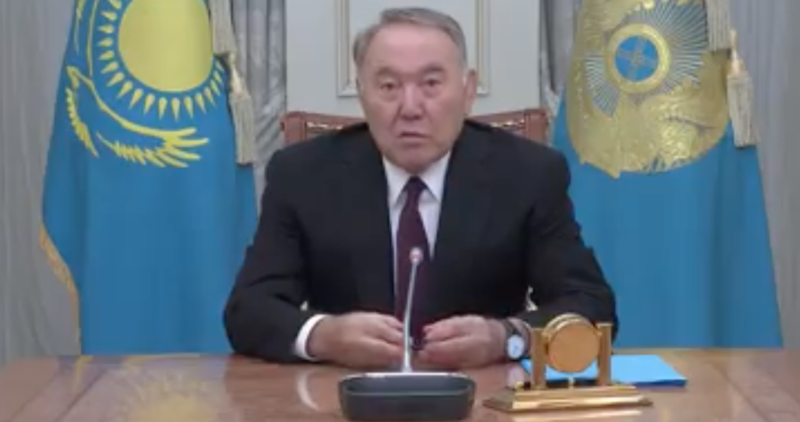 Those were the closing words of a February 5 video message issued by Kazakhstan’s president as he rushed to quash a swell of speculation about his departure from office. It was Nursultan Nazarbayev himself that instigated the whirlwind of chatter a day earlier, when he addressed the Constitutional Council for guidance on what powers he would retain were he to step down. The former Communist Party boss has been running Kazakhstan since before it gained independence in 1991, so the slightest talk of his relinquishing the presidency is always seized with gusto by a public starved of political excitement. In truth, however, even if Nazarbayev were to stop being head of state, he would retain a wide-ranging degree of authority under his bespoke title of Leader of the Nation. In his brief video address, Nazarbayev evinced transparent irritation at his permanence in office being called into question. “Between the adoption of the constitution … in 1995 and the current day, 220 appeals have been submitted to the Constitutional Council, including 22 on behalf of the president,” he harrumphed. Under the terms of the constitution, the president of Kazakhstan is deemed to have relinquished his powers upon inauguration of a new head of state or in the event of them being physically unable to do the job. Nazarbayev expressed concern that some of the mechanics of this process are vague, however. But he did so in way that will only further convince many people that he is giving serious consideration to retirement. “The constitution does not define the conditions whereby a president is replaced and does not provide for situations wherein [the president] retires voluntarily. In constitutions all over the world there are such provisions. Due to the great relevance of these points, I asked the Constitutional Council for clarification,” he said. What is particularly bizarre about this episode is that the monolithic nature of the top tier of government in Kazakhstan is such that these types of fiddly legalisms are of no real significance. In simpler terms, the Constitutional Council will simply rule as it is told. Writing on his Facebook page, Andrei Chebotarev, director of the Almaty Center for Contemporary Research, speculated that the Constitutional Council will likely offer guidance that permits Nazarbayev to leave office when and how he pleases. As suggested earlier, this is, in theory, not entirely unambiguous as the constitution only specifically allows for the head of state to leave office in the event of debilitating illness or if he or she has been removed from office for committing high treason. In short, Nazarbayev’s preference will be to avoid the precedent set by his Uzbek counterpart Islam Karimov, who died in the saddle in 2016, and instead to step aside and allow a successor to establish their authority in good order. Nazarbayev will, in any event, retain significant powers for as long as he lives. This sort of rearrangement of the furniture and some of the president’s recent populist messaging has sparked some speculation that a snap election might even be in the offing. Nazarbayev has been fighting a rearguard action to put paid to that rumor as well. In a press conference on December 27, he insisted the next presidential vote would happen on schedule, at the end of 2020. He has now doubled down on that message. “Under the constitution, the president has the right to call early elections, but this is not expected,” he said.